Excellent where Pump Discharge Control is essential, due to high velocities (10 FPS or more), and high pressures (over 100 PSI). 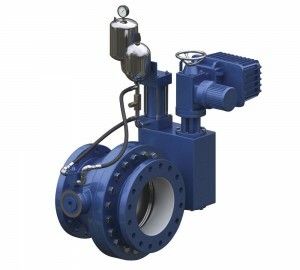 Electrically operated, to permit remote control of automatic pump stations, features: Shut-Off Valve – Throttle Flow Valve – Control Check Valve – Drain Valve and during electrical power loss, this valve will automatically shut-off, without assistance. Equipped with manual override and replaceable Buna-N-Seat. Body-Cast Iron or Ductile Iron, Disc-Ductile Iron, Shaft-High Strength Stainless. Ratings 125#, 250#, 300# class.